(07) 4051 4580 Ground Floor "Accent on McLeod"
Australian first, breakthrough in sleep-disordered breathing treatments introduces the Oventus Clearway Device™; a custom-made mouthguard which redirects air flow to bypass breathing obstructions. Future Dental has recently become one of a select number of authorised Clearway clinicians across Australia to deliver the ground-breaking new mouthguard to treat people who snore and suffer from sleep-disorder breathing. Future Dental has been working with patients suffering from obstructive sleep disorders including sleep apnoea and snoring for decades. Since 1980, our dental practitioners have constructed a full range of appliances to help our patients. With our extensive experience in this field, we can determine devices which stand out from the rest as a comfortable and reliable solution. After hearing about the success of this new appliance for treating individuals with a form of sleep disorder, Future Dental reviewed the clinical information and attended the Oventus clinician induction training, and now offer this device to patients. As seen on A Current Affair, the Oventus Clearway Device™ is the first and only sleep therapy device in the world which allows air to flow through to the back of the throat, bypassing nasal, soft palette and tongue obstructions. 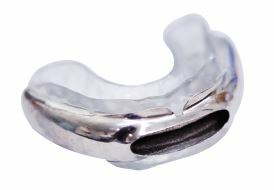 Clinical Director of Oventus, Dr Chris Hart announced the 3D-printed lightweight titanium mouthguard as the first of its kind to target people with moderate to severe sleep-disordered breathing. One of the most harmful forms of sleep-disordered breathing is sleep apnoea which is a condition where the air passage in the throat becomes obstructed during sleep and causes temporary pauses in breathing. This condition affects more than one million people in Australia. Future Dental has noticed an increase in the number of people suffering from sleep apnoea, in line with an ageing population and obesity rates. “People using other oral devices can have issues with them including chronic jaw pain, teeth loosening, teeth wear, ongoing adjustment, or nasal obstruction which stops many of them wearing their device,” said Dr Bob Gibbins, leading practitioner and founder of Future Dental. Oventus worked with the CSIRO on 3D metal printing technologies to develop the lightweight bespoke titanium product. CEO Neil Anderson said this advanced technology and precision design allows the air to flow past the soft palette and tongue, assisting patients with breathing obstruction to sleep comfortably. If you would like more information about the Oventus Clearway Device™, please visit here or call the friendly team at Future Dental on (07) 4051 4580. If you think you may have a sleep-disorder or would like to change your sleep-disorder treatment, seek medical advice from Future Dental. Have you heard about smile right payment plans? Address Ground Floor "Accent on McLeod"